Dr. David Kennedy says there is no such thing as a safe amount of fluoride. He states that even if you use it in toothpaste and spit it out, research shows that blood levels of fluoride increase. What does that do to children’s and your health? Interviewer: If there’s a way to tell that you know X amount of fluoride causes x amount of x amount of cancer and it’s linear would it be safe to assume that there’s no safe level then of water for fluoridation? that as a scientist how do you develop a safe level of exposure? And he said he doesn’t know how he would attack it but he thinks it would probably end up like lead. Where zero is the amount that you should be exposed to. Because the reason he brings up lead is, one, Dr Marcus was the guy that got lead out of the water in the first place and, two, Fluoride is more toxic than lead. So if everybody’s worried about lead today, well, why don’t we have our children brush with something that’s worse than lead? That’s insane! It’s a hairless toxic and arsenic if I invented an arsenic toothpaste we’d say “You’re protected because you’ll spit it out.” Well, you can’t spit stuff out of your mouth. If you measure blood level of fluoride and give a child a dab of toothpaste or do a topical treatment in a dental office, their blood level of fluoride goes up. Even if you supervise them and make them spit out, their blood level of fluoride goes up because your mouth absorbs whatever goes in. So the moral of that story is you should not put anything in the child’s mouth that you also couldn’t put in the dinner. So if it’s not a food, if it’s not a nutrient, it doesn’t belong in the child’s mouth. This bit of info was taken from Fluoride free Peel website. 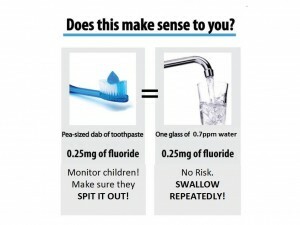 It explains exactly how much fluoride is tooth paste and the fact there are poison warnings if ingested over a certain amount yet no warnings are given when drinking a glass of water which has the equivalent to a pea size amount of toothpaste. According to Health Canada, fluoridated toothpaste is a drug even though you’re supposed to SPIT IT OUT and children age 3 – 6 should be exposed to no more than 0.25 mg fluoride in toothpaste, at most twice per day. Parents are advised to call poison control or seek medical attention right way if more than 0.25 mg fluoride is accidentally swallowed while brushing. The FDA, the CDC, the ADA, the CDA, the American Academy of Pediatrics, poison control centres and toothpaste manufacturers also agree that children up to age 6 should SPIT OUT0.25 mg fluoride when brushing their teeth with the recommended pea-sized bit of fluoridated toothpaste. The above organizations also agree that children up to age 3 should use only a rice-sized bit of toothpaste containing only 0.1 mg fluoride and SPIT IT OUT. Meanwhile, every 385 ml of Peel’s fluoridated drinking water contains, on average, 0.25 mg fluoride. And every 150 ml of our drinking water contains 0.1 mg fluoride. 385 ml of our fluoridated tap water has 0.385 L x 0.65 mg / L = 0.25 mg fluoride. It’s the same dose of fluoride as found in a pea-sized bit of toothpaste. 150 ml of our fluoridated tap water has 0.150 L x 0.65 mg / L = 0.10 mg fluoride. It’s the same dose of fluoride as found in a rice-sized bit of toothpaste. The fluoride concentration in Colgate for Kids toothpaste is 1,100 ppm. At 130 grams of paste in the average tube, this equals 143 milligrams of fluoride. have heard stories about people cutting pills in half, then taking them under the tongue, to produce the same effect as swallowing one pill). The reason for this increased effect is the digestive tract is incredible harsh. And it’s meant to be — it’s how food is broken down, and the nutrients get stripped out, while the waste goes … well, you know…….